Courtney and I went on a quick trip to DC on Thursday to pick up Jack and we went out to eat at some good places. After an action packed day we ended up in Dupont Circle where I made a reservation at Firefly after looking through Open Table reviews. It turned out to be a good pick. We had a dinner reservation for 7:30 but still had to wait 20 minutes for a table as the place was hopping. It was a beautiful evening and everyone was out. After having a beer at the bar we eventually made it to our table. For firsts, Jack had a bowl of matzah ball soup and Courtney and I split a plate of shrimp and grits. The shrimp and grits were great – creamy and cheesey. I don’t think I have ever had grits before… I like them. For seconds Jack had a plate of sausage and greens, Courtney had a vegetable casserole of braised endive, asian mushrooms and other veggies over polenta and I had a soft shell crab. All were good. The soft shell crab was a work of art. I wish I would have taken a picture. It tasted as good as it looked – crispy, chewy and just a little bit spicy. One of the best dishes I have had in a long time. We skipped dessert and had ice cream at a place a few blocks down the street. 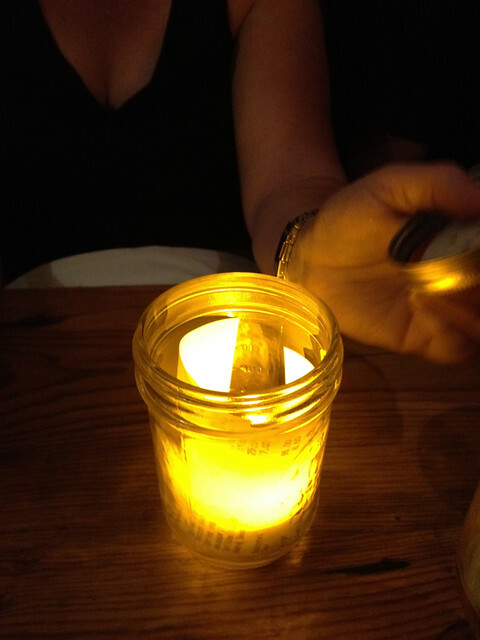 the check came in a jelly jar lit up by fireflies. After walking and walking and walking we stopped for lunch at Pizza Paradiso in Georgetown. 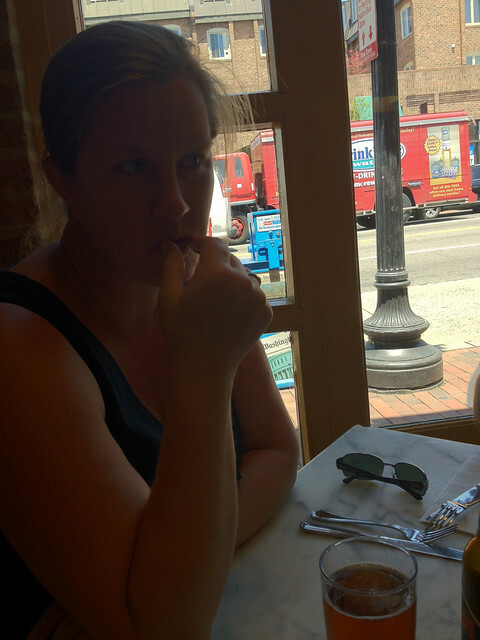 Courtney was happy and officially declared it vacation as she had a peroni on draft for lunch. We split a big salad of greens, white beans and artichokes and ordered two big pizzas…a margarita and one with pepperoni. The margarita was the best…it always is. The pizzas were very good; crust nice and crispy and charred, chewy in the center, with fresh mozarella and just a small amount of sauce. Just the way we like it. Again, a good place to be. I made a reservation at Graffiato about three or four weeks ago once we knew for sure when we were going. 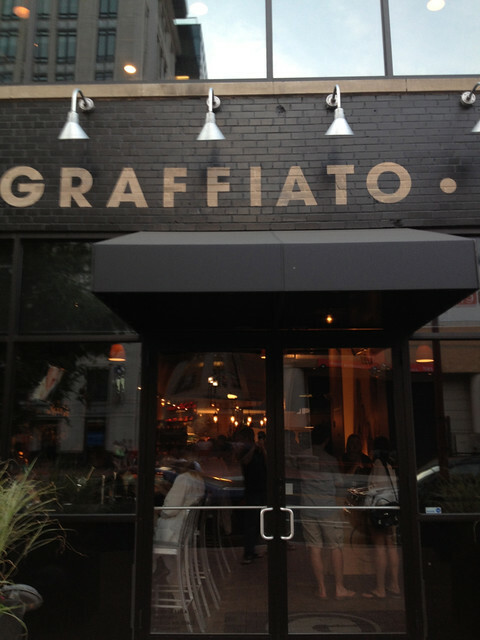 Graffiato is Top Chef contestant Mike Isabella’s restauraunt in China Town and is a hot ticket. It reminds me a lot of Cleveland’s Lola but a lot more casual. Everything is small plates and we tried a lot of good stuff. We split six plates: red and yellow beats with a citrus sauce; flatbread with pepperoni sauce; a platter of six different cheeses that we chose; hangar steak with a green sauce served with little chunks of deep fried polenta (mmmmmm); pecorino tortellini with peas, pea tendrils and mint; and salmon served over a bean puree with arthichokes and capers. All were excellent. We split three desserts: chocolate cake with salted caramel gelato; blood orange cheesecake with passion fruit sauce; and a serving of mango sorbet. Again, all were excellent.